Your neighbors are counting on us. We can find the perfect lot! Find out about why we are SW Florida’s #1 Real Estate Team! Home Valuations, Curb Appeal, or Just Need Guidance? We have a proven track record we would love to show you. We are committed to elevating the reputation of REALTORS by providing exemplary service. We measure success in smooth, on time closings and happy customers. Our commitment to exemplary service is why over 70% of our business is repeat or referrals. If you, your friends or family would appreciate working with a professional committed to the highest standards, please consider us. We look forward to WOWING you. We contracted with Angie to sell our home and to help us purchase a new home. Throughout the entire process, Angie FAR EXCEEDED our customer service expectations. She was very accessible by phone, text, or email to answer any of our questions, large or small. Angie kept us up to date on how things were going. I never felt out of the loop or in the dark. I also loved the technology she uses. Texting yes or no to accept a showing was so convenient. And all the documents were signed electronically!! That was a huge time saver. Angie partners with her husband Adam, and they make an amazing team. Adam took fantastic pictures of our home to post on-line, and it was nice to know that if Angie wasn’t available, Adam was right there to help. I would highly recommend the Nichols team, and they will be the first people I reach out to the next time I need a real estate agent. We contacted Angie in July 2016 about the need to look for a home to purchase as the rental we were in was going to be given to a family member. We had 3 months to find a home and move. She was FANTASTIC! Angie sent us links to every house she thought we’d like within our parameters and we were able to drive by and make a decision about which houses to look at further. As time was short, we spent one day looking at 7 homes and fell in love with the last one we saw. She walked us through everything! Got us in touch with a broker, reassured us when we had mini-freak outs!, answered every question we had and was available to us when we had MORE questions! I KNOW I wouldn’t be typing this review from my new kitchen, overlooking our gorgeous backyard and canal if it wasn’t for her. I HIGHLY recommend Angie for ALL of your real estate needs. She’s knowledgeable, dependable, extremely responsive and will work really hard for YOU! I have recommended Angie to a few of my friends recently and will continue to do so. She will fight to make sure you get what you want. She is the type of realtor that’s good to have on your side! We found Angie to be a very energetic, vivacious and intelligent woman to work with from the time we met her and she estimated our home in Cape Coral. We needed to leave for the north and Angie was willing to help us navigate the sale from a far. Thank you Angie! Selling my home was really intimidating at times. You are so knowledgeable about the market and always had sound advice and suggestions to give. I had no doubt you were trustworthy and representing me well behind the scenes. You were tireless in promoting my property which resulted in a fast sale and closing. I will certainly recommend you to anyone looking for a REALTOR®. Moving to Florida from Chicago was a daunting prospect but after my husbands company recommended Angie to us, the experience was made very easy because of her. We had a whirlwind three day trip here to find a home and actually made a purchase during that time. She listened carefully to our needs and wants and only showed us homes that fit our list. She was extremely professional, knowledgeable and organized. Although most things were being done out of state, the entire process was stress free because of Angie’s competence and great communication skills. Thank you for making our move to Florida so enjoyable! Angie did a great job marketing the sale of my dad’s property after his death. She advised us on staging, cleaning and setting a competitive price. Her follow thru is excellent. She shares feedback – both good and bad and she is proactive remaining in contact during the entire process. I am very happy to recommend Angie for her stamina, market knowledge and follow thru. She did a great job for us as we were out of state and relied extensively on her and her team during the process. Angie is amazing. She is a great listener and carefully navigated between the different needs/wants that my wife and I were expressing…and that wasn’t easy since we weren’t sure what we wanted! But in the end her patience and persistence drove us to narrow our choices and helped us to make the best decision. 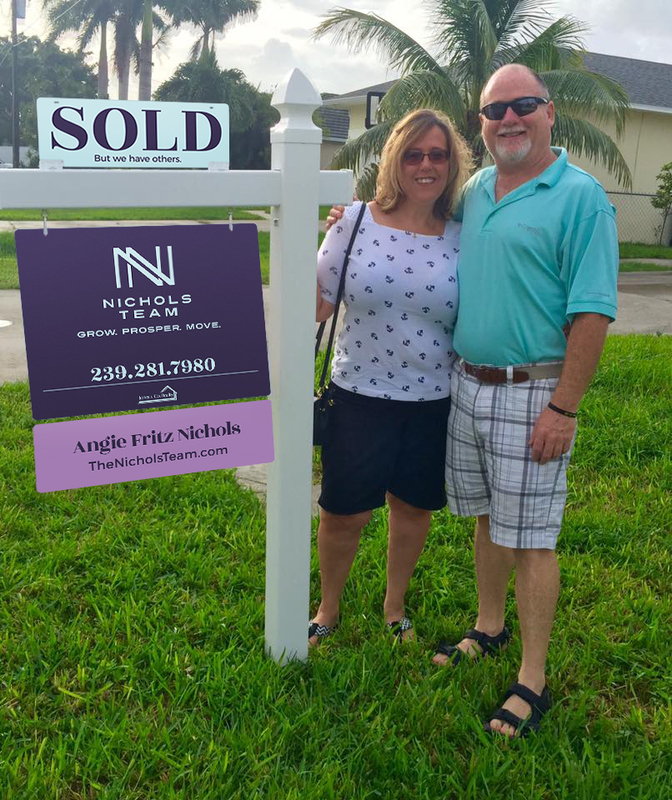 I must say Angie is the most competent and thorough realtor we have ever worked with…we have been married 35 years and have bought/sold 15-20 homes/condos around the country. Angie was the best realtor we’ve ever had! Without ANY hesitation I’d recommend Angie.